Cross-cutting activities (XC) in MACSUR concentrate on issues that we identified as requiring a joint approach across Themes and are supported in the MACSUR membership by sufficient financial and time resources to carry out meaningful tasks. These comprise scientific activities that focus on methodological improvements (XC1,3,4), on regions (XC6,7,16), and societal and systemic challenges (XC5,8,9,11,12, 13, 14,15). 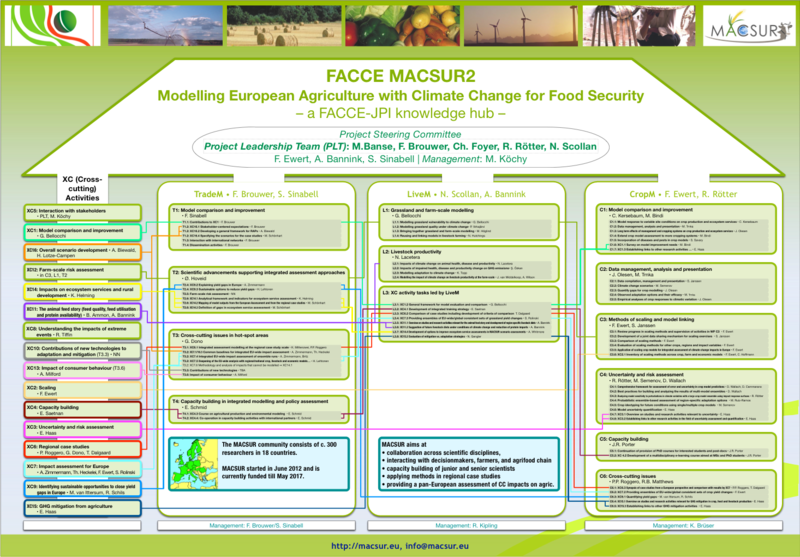 Results of the cross-cutting activities are geared to inform decision-makers and the agro-foodchain about the projected trends of crop and livestock production, and prices within the constraints of climate change and global population growth, implications of farm management practices, and about the feasibility and effectiveness of options for adaptation and mitigation at different spatial and organisational scales. Stakeholders interested in the activities are welcome to follow the links and to contact the responsible persons.